Cabot Clothbound Cheddar Cheese for sale. Buy online at Zingerman's Mail Order. Gourmet Gifts. Food Gifts. Cabot has been making cheddar in America for over ninety years. Nearly all of what they make is standard fare, wrapped in wax. It’s good, don’t get me wrong. It’s just that wax wrapped cheeses don’t evaporate and breathe the same way as those wrapped in cloth. It’s much more difficult to age cheese in cloth, and the cheese loses weight faster, which makes it cost more. Enter Mateo and Andy Kehler of Jasper Hill Farm. They’re buying wheels of clothbound cheddar from Cabot and aging them in their cheese caves in Vermont. Why all the fuss? Clothbound is the way cheddar was made originally (and still is at Montgomery's, in England). To my mind it has a far more compelling flavor. Cheddars aged in cloth have a complexity and length of flavor that's unmatched by wax. The wheels we get are specially selected for us by the team at Jasper Hill. The rinds are brushed with lard, and they have a beefy, brothy flavor. 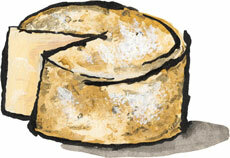 Aged at least 9 months, it’s a sturdy cheese with a complex, lingering finish you can’t shake. A great cheese for serious snacking or on a world class cheese platter. The current wheels we're cutting into were made in July of 2018. They're particularly bright, with an almost lemony acidity above that classic cheddar tang.